Before we dive into troublehsooting let’s keep the following in mind when an ISDN call progress. 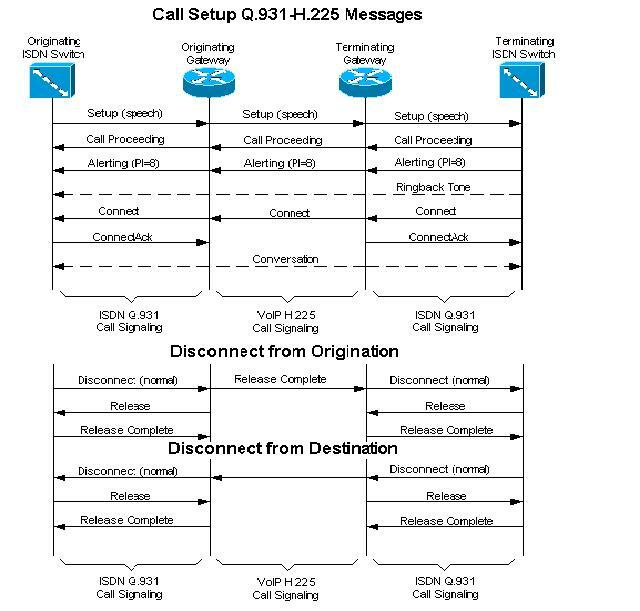 H.225 is a protocol specified by H.323 for call signaling and call setup. H.225 specifies the use and support of Q.931. Cut−through in the Backward Direction: This means that only the voice path from the called party to the calling party is complete. Cut−through in Both Directions: This means that the voice path between the called and calling party is complete. The indication of in−band tones and announcements is controlled by the Progress Indicator (PI) information element (IE) in ISDN and H.323 networks. The Progress Indicator signals those interworking situations where in−band tones and announcements must be used. Progress indicator = 1 Call is not end−end ISDN. Further call progress information can possibly be available in−band. Progress indicator = 2 Destination address is non−ISDN. Progress indicator = 3 Origination address is non−ISDN. Progress indicator = 8 In−band information or an appropriate pattern is now available. The indication that tones and announcements are available is signaled by an Alerting, Call Proceeding,Progress, Connect, Setup Ack or Disconnect message that contains a Progress Indicator equal to 1 or 8. When a Setup message arrives at the originating gateway with a PI equal to 3, it means that the switch informs the gateway that in−band messages are expected. Note: The lack of a PI in a message assumes that the originating device provides the appropriate tone signaling to the calling party. On the gateway, if you have configured to cut through voice and to send ringback tone, and you still do not hear the ringback tone, it is possibly an issue with the service provider PBX configuration. Cut−through in both directions can be set on the gateways through the use of the voice rtp send−recv Cisco IOS global configuration command. An IP phone makes a call to PSTN number but doesn’t hear ringback tone. Terminating gateway is connected to CAS or analog device. It sends the PI information in an H.225 Progress message to the originating gateway. The originating gateway/router is unable to decode the H.225 Progress message. The third party originating gateways and gatekeepers do not properly parse H.225 Progress messages. The POTS (PSTN/PBX) user places a call to an IP phone through a Cisco router/gateway and does not hear a ringback tone before the call is answered. This is commonly caused when the inbound call does not come in to the Cisco gateway/ router with a PI=3. ISDN switches send the PI=3 in the Setup message to inform the gateway that the originating call is non−ISDN and in−band messages are expected. When a call to an IP phone is answered and then transferred, the caller does not hear a ringback. From the perspective of the Cisco IOS gateway/router, the call is completed once the call is answered by an IP phone (through Cisco CallManager) or Cisco Unity Voice Mail system. Any further progress tones (in case of a call transfer) need to be generated by the terminating device. However, Cisco CallManager and Cisco Unity cannot generate the in−band progress tones. When a user dials from an IP phone registered to Cisco CallManager that is destined to an IP phone registered with Cisco CallManager Express, the ringback is not heard. This occurs even though the receiving phone rings and the call is completed.